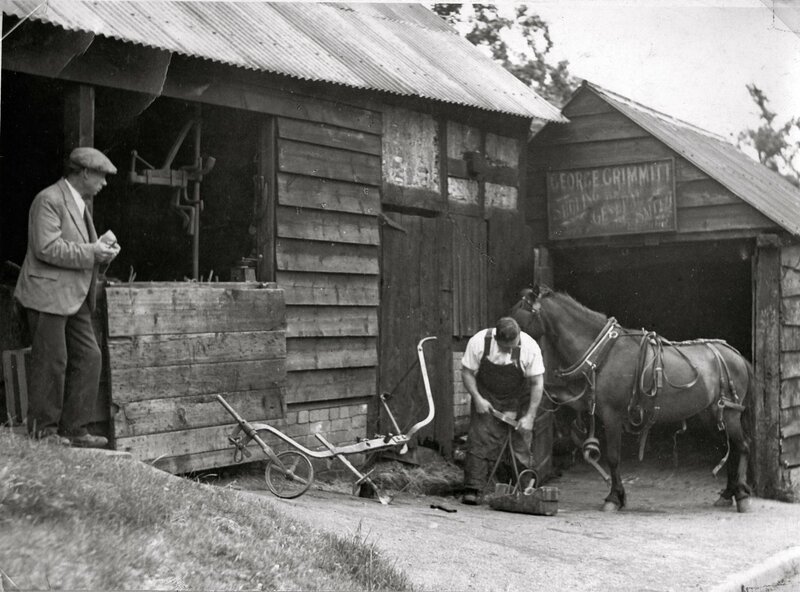 Black and White Garage: Alcester Road. Four Chevrons Garage: Alcester Road. The Cider Press: Church Street. The Old Forge: Stratford Road. such as church, school, businesses etc. Harvington was until recent times a fairly self-supporting community with bakery, caravan maker, railway and coach stations, church and chapel, post office, shops, undertaker, builders, brickyard, police station, carpenters, brewers, blacksmith, wheelwright, miller, farmers, even a telephone exchange. 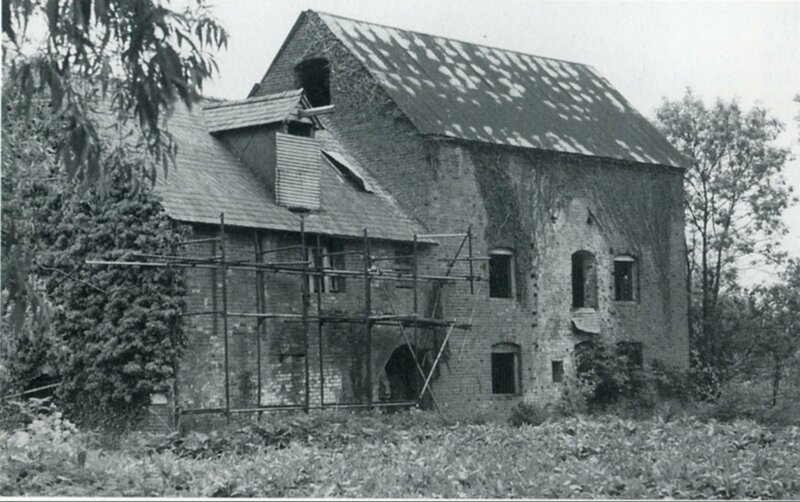 Most of the buildings for all the above activity survive such as the 'Hop Kiln' the mill, or the 'Old Exchange'. The buildings should appear in this section, but because they have been converted into private homes one must look in the 'Houses' section to find them. The Baptist Chapel, Village Street. History of the property so far gathered. Black and White Coaches depot that once stood on the corner of Leys Road and Alcester Road. The Black and White Garage, which stood on the corner of the Alcester Road and Leys Road, was built in 1935. Albert Edward Marsh had started with a bike shop run from either Bredon View or Cotswold View in Village Street 1925. His business evolved into building and running coaches. He was very successful during and after the War with his manufacturing business and coaching people between Harvington and the Redditch area. See under Transport. The business folded sometime in the 1980's and the site was re-developed. The site had petrol pumps for the public. Further reading on the Marsh family and their home see 'Leylands' under Houses. A number of small old properties, now demolished, in Swan Street, Evesham. Two houses on the lower part of Cress Hill. Cross Cottages, nearest to Orchard Close. 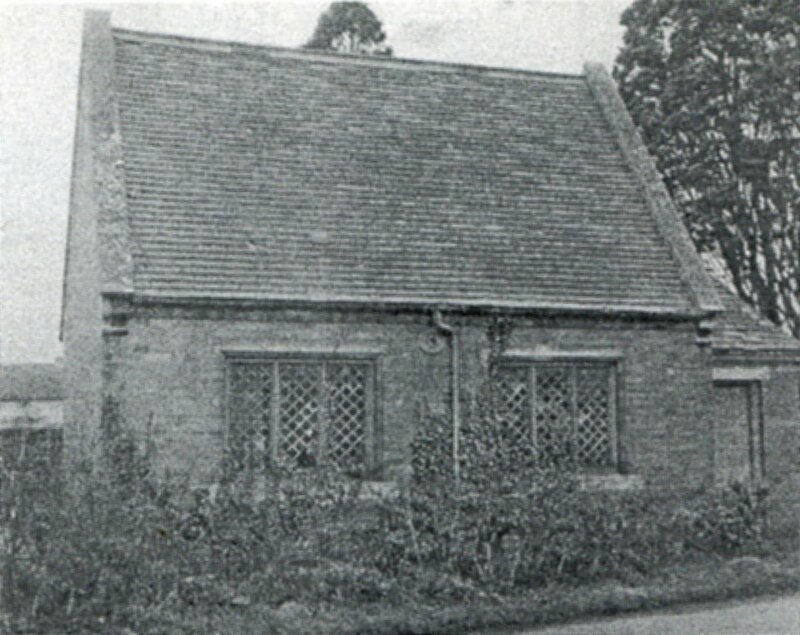 The first house after his garage on the Alcester Road. Leylands in Leys Road, where he lived. Also a property in Cropthorne which he called Southern, his wife's maiden name. History of the property so far gathered. Please refer to the webpage on the dovecote.htm, for a full description. No known photograph found as yet. The Wagstaff family owned the garage, which was also had petrol pumps. Mr & Mrs Wagstaff had four sons. The older properties on the south side of Alcester Road are as from the corner with Village Street:- Rose Villa, Greengates, Four Chevrons, Four Chevrons Garage (now replaced), West Holme, Fairview. The site had petrol pumps. Part of the Harvington Trailers complex. 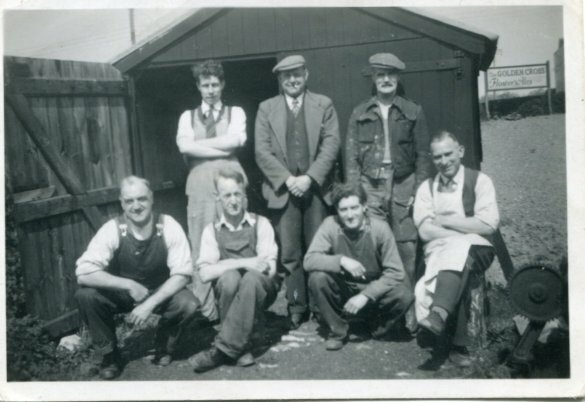 From left to right and standing is John Austin and Bert Dore, Walt Sandals is sitting then Bill Bailey and Jim Middleton are kneeling, in front is Paddy Glennon (right) and Sidney Hall (left). 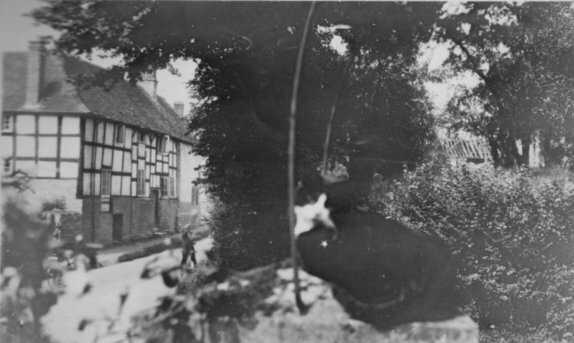 The photograph was taken from the Evesham Road. To the right were large high doors into the building. Note the bungalow in the background to the right, this was called 'Mandeville', owned and occupied by the Coley family. Photograph kindly donated by Harry Reynolds who probably took the picture. A shed in the open area between the Harvington Trailers building and the Cross. 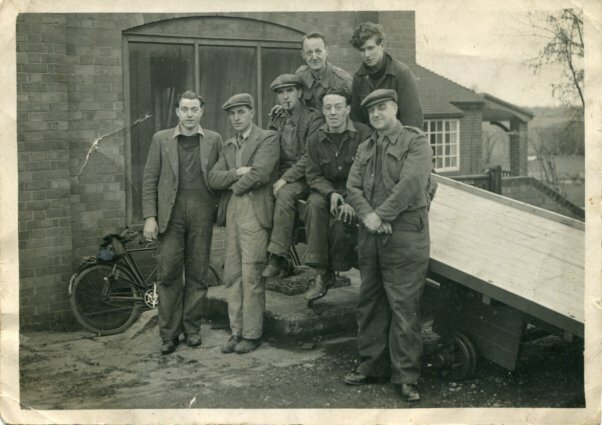 From left to right at the back: unknown, Jack Horne, Charlie Grove; in the front: Jim Middleton, Bill Bailey, Don Grove, Lawrie Smith. It was taken from the front of the building in the previous photograph looking north towards the Golden Cross. One can see the sign advertising the Golden Cross in the background to the right. The sign stood on the the corner opposite to the pub. Photograph kindly donated by Harry Reynolds who probably took the picture. The land on which Harvington Trailers stood is now covered in housing and there is no indication that this was once a thriving production site for trailers and caravans. The land was rented from the Coley family. Manufacturing started with a Mr Jenkins who made toy aeroplanes for children to ride in. On the same site in around 1943 there was manufacturing and repair plant called 'Harvington Trailers', run by a nice man called John Douglas Lion-Smith, from Inkberrow. Initially his only helper was Harry Reynolds. Harry now (2017) lives in Ragley Road. The business subsequently started to make caravans prospered to the extent where the caravans became widely known for quality. 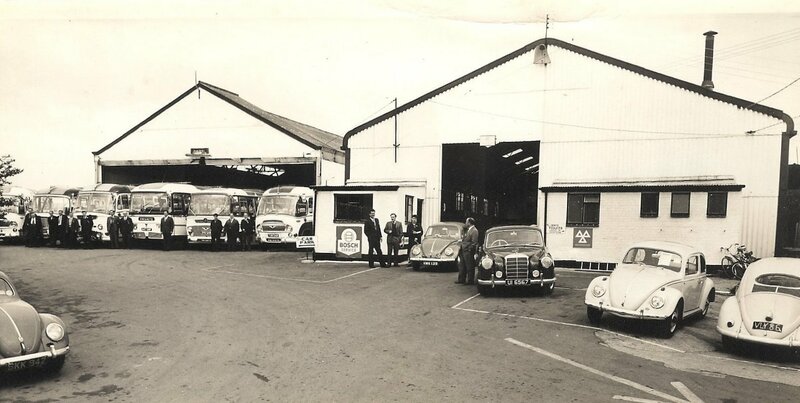 Later on the caravan manufacturing closed and the site was taken over by Gailley Caravans. Caravan production ceased in the 1960's, see under Transport for more details. Later, a business called Kenleys operated from here. The manufacturing of small boats and canoes continued into the 1980's. The site had petrol pump for the public. The Mill, off Anchor Lane. Watermill, disused. Circa 1800, machinery replaced later in C19. English garden wall bond red brick. Slate roof with gabled ends and brick dentil eaves; taller main block reclad in corrugated sheet steel. PLAN: Rectangular plan with undershot waterwheel at the west end and by-pass through the east end of the mill; the east end appears to have been extended. An extension on the north front of the main block has been demolished. EXTERIOR: Main block has 3-storeys, 3 bays, centre loading doors on ground and first floors and flanking windows, all with cambered arches; second floor windows in gable ends; door and window frames missing. 2-storey and attic range on left [east] has cambered archway through and gabled hoist housing in roof Large iron and wood undershot waterwheel on west end. INTERIOR: not inspected but some of the later C19 machinery is recorded as being intact, including the primary gearing. NOTE: Harvington Mill is situated on the River Avon. George Henry Osborne, Harvington Mill, was buried 9th June 1880, aged 52 years. Thomas Lionel Hathaway, of Harvington Mill, was buried 30th August 1883, aged 9 months. The Reading Room, Village Street. In it were to be found books and some daily papers. Readers paid 2d a week to visit. Saint James the Great, Church Street. The Infant School, Village Street. The old and present forge, Stratford Road. The blacksmiths lived in the adjacent property. This was the timber-framed cottage (see Blacksmith Cottage) before the 1930's. Afterwards, the last village blacksmith George Grimmett lived in the replacement number two Hop Kiln Cottages. The Knight family were the smiths, plough wrights etc. in eighteenth and nineteenth century. George Gwimmitt was the smithy in the 1920/30's. The present forge building was a replacement of the old forge demolished in the 1930's. In 1939 Mr Gwimmitt was living in number 2, Hop Kiln Cottages, the Council house directly above and behind the forge. At some stage the present forge ceased and the building remained closed for many years. The Attwoods of the Old Bakery now own the building. The Cider Press, Church Street. 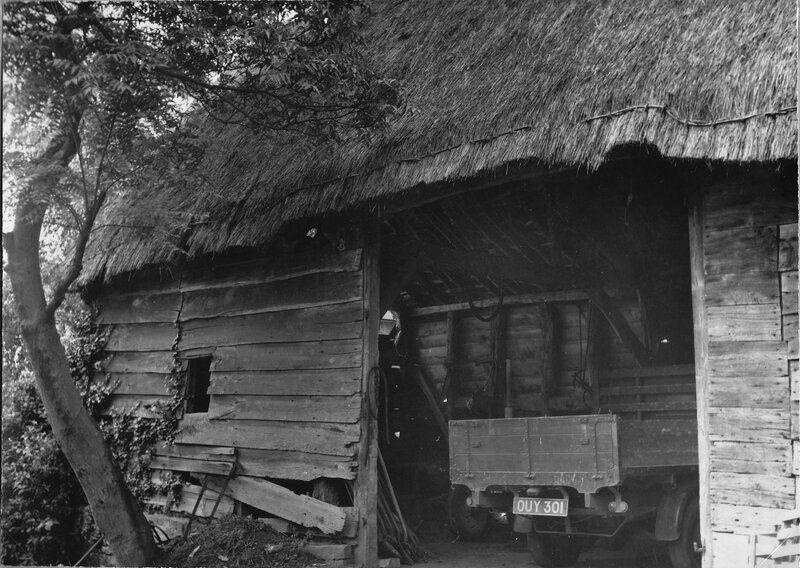 Very little is known of this timber-framed thatched barn. A close study of the only known close-up photograph of this building suggests that it was pre-Victorian. Its construction was probably of elm. Although it was situated behind the two old cottages in Stratford Road, it was accessed via the lane to the Hopkiln. The Cider Press was demolished along with another barn and the two cottages in the 1930's. The junction of Stratford Road, Village Street and Church Street. The buildings in pink are Crooked Walls (177) upper centre and the two old cottages (180) centre. 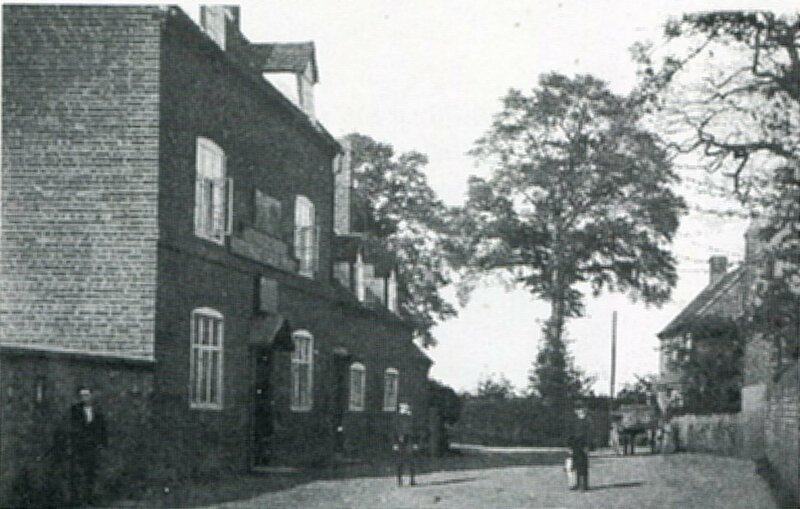 The Cider Press is the building closest to and at right angles to the two old (now demolished) cottages. One can just see the roofless barn in the background to the right of the cat. History of the property so far gathered. Built on land donated by the Penney family of Cedar Lodge. In 1953 Mr Trechmann payed for two television sets to be set up in the hall for the Queen's coronation for anyone in the village who did not have a television. Around 2012 the hall had a major makeover.